Loved the recipe… I’ve had my share of failures with pizza base, but this was not fussy and had the perfect texture when baked. Thanks for sharing! 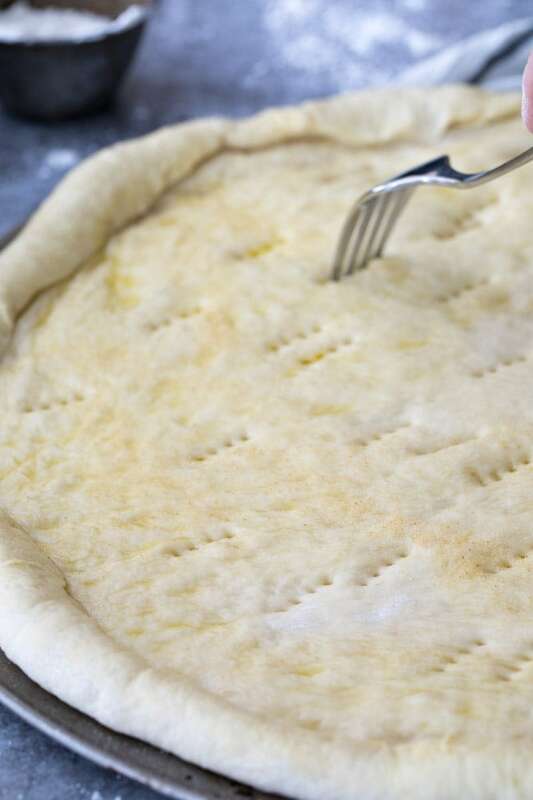 This is my go-to pizza crust recipe! Other recipes I’ve used brown deceptively quickly, leaving a soggy or under-cooked bottom. This recipe is crisp, chewy, and delicious every time! Thank you!!! Traded in my mom’s crust recipe for this one! FAN~tastic crust!!! Couldn’t be easier. Used this as a base for a focaccia that called for a “pizza dough” to start. Used Pamelas GF flour since my daughter is Celiac so I used a stand mixer with a bread hook to stir since GF doughs are very grabby. Came out great. Will be using this as our standard pizza crust going forward since it was so easy. This is my go-to recipe I let it rise in a big stainless steel bowl. I let the bowl sit on a HUGE COFFEE CUP inside the coffee cup is steaming hot tap water it will help dough rise! How would this recipe differ if using whole wheat flour? I just made my very first pizza and im so glad that i stumbled with your dough recipe! It turned out to be perfect! Thanks for sharing this recipe! Loved the recipe came out perfect the 1st time for me. The crust was even lightly crispy and flakey. My family loved the pizza. Thank you for posting this recipe. Awesome and easy recipe. Came out great! Thank you! 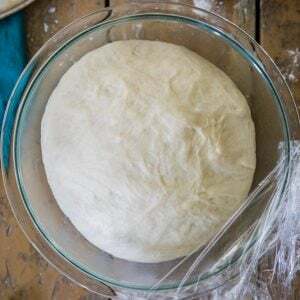 Terrible recipe, very stiff and has nothing to do with the pizza showed in the video, it’s a recipe for bread dough not pizza, a vad one also! Thank you for wasting my time and effort! Hi Mariam! I’m confused, the recipe in the video is literally the recipe listed in the post? Sorry to hear it didn’t turn out for you, happy to help troubleshoot if that might help. So today I made another one without useing grease proof paper, and I remembered to prick the dough, and it is absolutely fine, . Wow, way to be a horribly rude person. Move Along and enjoy your terrible life. This is remarkable! My picky, wont eat anything adult child loved it. Said it was better than Mtn. Mikes… Thank you so much! Foolproof n yummy!! Excellent n thank you! 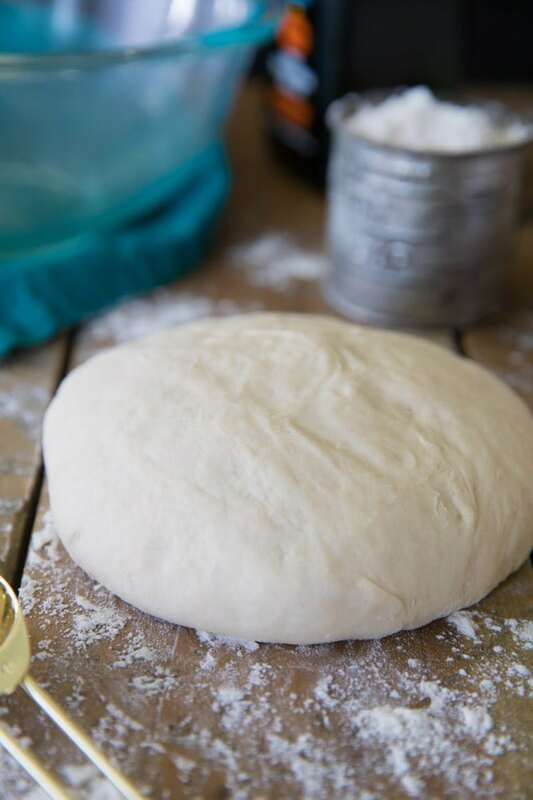 I have tried so many times with so many recipes to make a dough that had good consistency and good taste and thanks to you I finally found one I’ll use forever! I was doubtful as it seemed too easy and the method sort of unconventional but It IS so easy and it’s IS delicious and IS NOT gooey! If I’m using a pizza stone what temperature and time do you suggest? Made it on a cookie sheet and it was great but I wanted to try my stone. 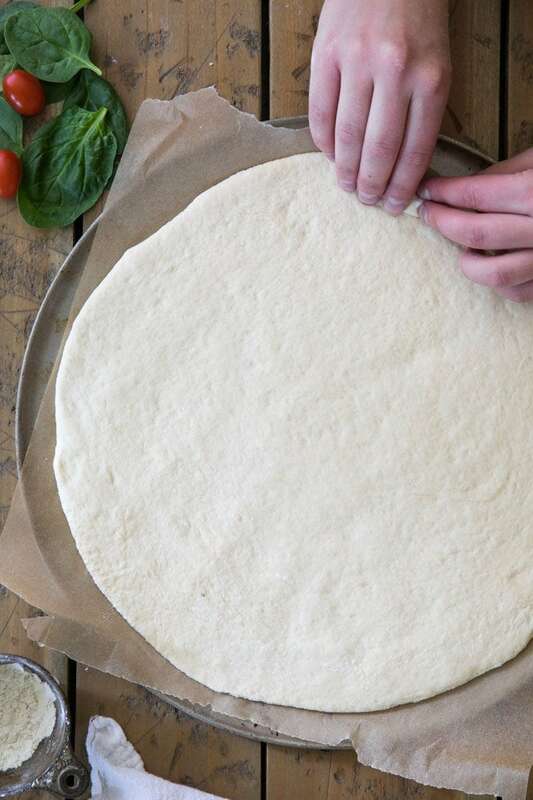 The most important thing to remember with a pizza stone is to heat it thoroughly at a very hot temperature. That generally means 500 F+ for no less than an hour. Once fully heated, the pizza will take 8-12 minutes to fully bake. (In a professional 800+ oven it would take 3-4 minutes). The reason for the long preheat is because the stone absorbs the heat like a sponge, but it takes a long time to fully heat through. Once hot, it will bake and char the crust at the same rate that it takes for the oven to melt and brown the toppings. Also, consider baking your pizza on the top rack of the oven. This effectively simulates the narrow deck of a professional pizza oven, cooking and browning the top of the pizza with the reflected heat from the ceiling of the oven. I have baked on a stone for many years. For pizza, heat the stone 475F for about 20 min so it gets very hot throughout the stone. 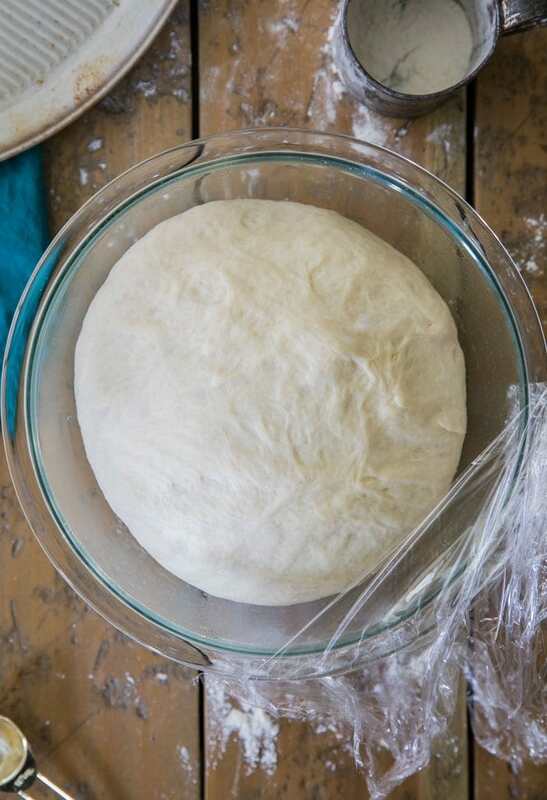 Slide your dough onto the stone using a “peel” because if you’re making pizza on a stone a lot, you need one. 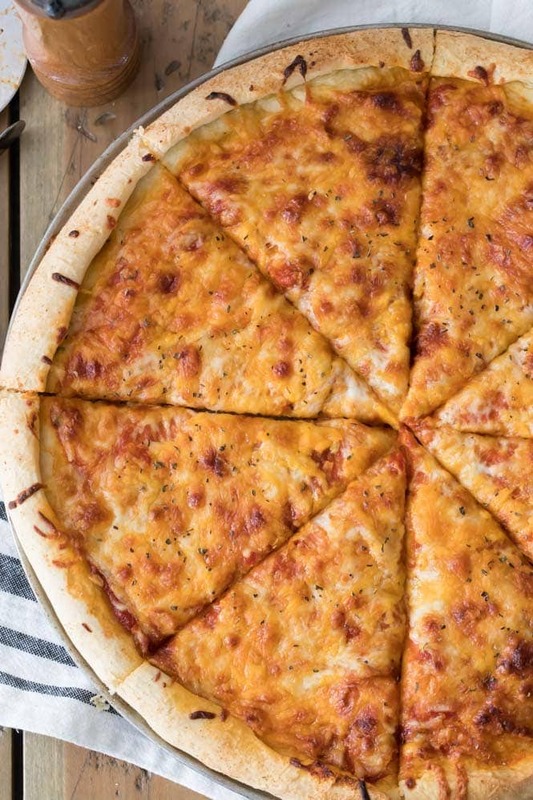 Bake pizza until it’s done. About 20 min.